“So dawn goes down to day, the poet wrote. Nothing gold can stay”. It is said that if you learn to accept rather than expect, you will have fewer disappointments. But I guess, it is human nature to expect. I had huge expectations of this book after the overwhelming amount of reviews, and the generous ratings it received. However, if I had to describe my thoughts about this book in a nutshell, it would be: Great Expectations + Average Reality = Huge Disappointment. This book gave me a peek into the world of kids/teens who are battling disease. I had not read anything like this before, and it was part of the reason I picked this book. What I particularly liked was that despite the fact that the main protagonists are suffering from cancer, it is not just another Cancer Book. It is so much more. There are some really great thoughts expressed in a very beautiful way. It’s also engaging and well-written. 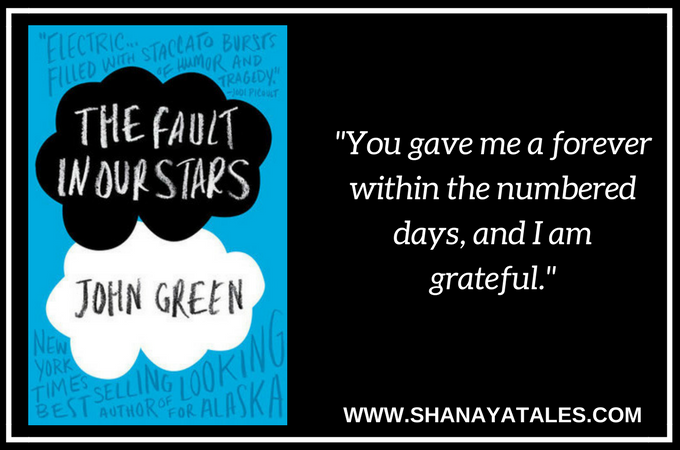 A concern that a lot of people seem to have with this book is that Hazel & Augustus (the main protagonists) do not speak like teenagers. I tend to agree. They think and act like teens. They just don’t speak like teens. The counter argument is that they are simply smarter than the average teen. However, I don’t think this has anything to do with being “smart”. Yeah, they are smart kids, they’ve been through a lot, and they’ve had to grow up fast. And while they are both smart, smart doesn’t necessarily mean speaking like a Yale literature major. However, the single most disappointing aspect of this book is the subplot that involves the protagonist’s favorite writer – Peter Van Houten. He seems more like a plot device to hinge the book on. While the author was able to set up some wonderful sequences in Amsterdam (where Peter Van Houten lived), the interaction with the character himself seemed forced and false. Also, to make matters worse, he re-entered the plot several times, and not once did he redeem himself. It just got more pointless every time he made an entry, and my hope that this is all going to make some profound sense eventually- died like you fall asleep, slowly and then all at once. Having said that, I really liked the plot, and felt that there was so much more potential. This is a shame, because clearly, John Green can write. I wish that the protagonists could have sounded more like teens. I wish that the Peter Van Houten track could just disappear from the story or at least make more sense. But, like the author says in the book, “The world is not a wish-granting factory, my friend”. At one point in this book, the protagonists discuss their feelings on the afterlife. This made me think about my thoughts on this subject. I happen to believe that there is life after life, not in terms of heaven and/or hell, but something for sure. I haven’t worked out all the details in my mind – yet. 😛 But, I do believe in a world beyond ours. How about you? Do you believe in an afterlife? « Do Opposites Attract only in Science, or even in Love? 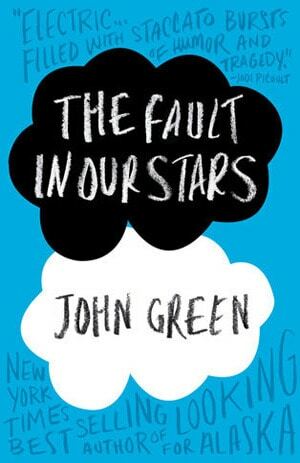 I’ve yet to read this book, or any book by John Green as a matter of fact. I think like you, I might be disappointed too. Of late, books marketed as YA have not really sparked too much interest in me. I do believe in an afterlife. It’s too hard losing people if you can’t believe there’s something after. I avoid reading books like this that no matter how well written, I know they will break my heart. As a former high school teacher, I said good bye to too many teenagers in real life, I can’t expose myself to it in fiction. Thanks for being my minion. I’ll be sending you the badge later today. One of my posts next week will feature my minions with links to your sites. I’ll let you know. You made my day. This is such a wonderful review, Shantala. You know I’ve been reading some glowing tributes as well about this book. Now, I am wondering whether I should read this book. Very honest review. Thanks Rachna 🙂 I guess the glowing reviews are given mainly by the teenage community, and I can see why they like it. It is really a mixed bag. However after so much hype, I kind of felt let down. I was very excited about reading this book because it is based in Indianapolis, where I live. When I did get to reading the book, I practically had to force myself to get to the end, because I never leave a book unfinished. I think your review does justice to the book. This was one of those larger infinities, at least that is what I thought! “And while they are both smart, smart doesn’t necessarily mean speaking like a Yale literature major.” <–So true! LOL, love the way you worded your criticism here. Spot on! I totally agree with your assessment. I also had huge expectations of the book, and even though I really like John Green’s videos on Crash Course and VlogBrothers, I have to say I was entirely underwhelmed by the plot of the book, and the way the teenagers spoke. It makes me a little hesitant to pick up another book of his and face the same disappointment. Liked the way you started this write-up..& if ever I’ll read this book will be coz of the positives you’ve listed.. Thanks a lot Megh. 🙂 Yes, I do agree. Afterlife is a comforting thought to those who live on, and deal with the loss of their loved ones.